"This is just a really good example of what can happen when people join forces together"
Instructors march to Denver Public Schools headquarters to deliver Valentine Day cards Wednesday, Feb. 13, 2019, in Denver. 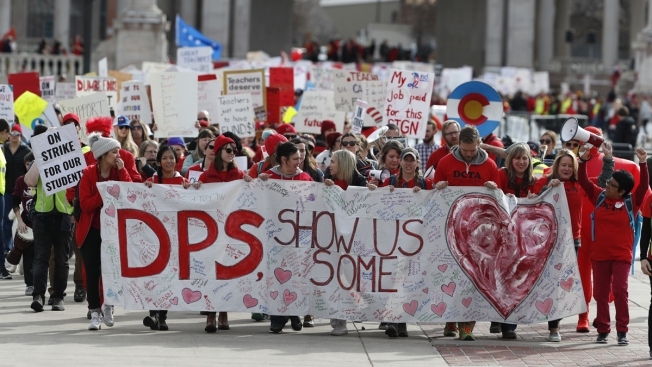 Teachers walked off their jobs Monday, the first strike by teachers in Denver in 25 years. Denver teachers ended a three-day walkout Thursday and returned to their classrooms after their union reached a tentative deal raising their pay as much as 11 percent. The deal was worked out in talks that lasted through the night and signed shortly before classes started, giving the teachers short notice and little time to get to their schools. They were encouraged to return to their classrooms if they felt ready, even though the deal awaits ratification by the full union membership. It was not immediately clear how many chose to return to work. At East High School near the city's downtown, returning teachers were greeted with high-fives from security guards at the main entrance and the educators expressed relief at the outcome. Advanced Placement government and politics teacher Susan McHugh said she had an hour's notice before the start of classes but rushed to school. She was prepared with a lesson plan based on her experience — a discussion about the labor movement and the power of collective bargaining. "This is just a really good example of what can happen when people join forces together," she said. More than half the district's teachers went on strike Monday after negotiations over pay broke down. The contract agreement gives teachers raises of 7 to 11 percent, built-in cost-of-living increases and opportunities for future salary hikes. The key sticking point of variable bonuses for teachers working in tougher environments was put off to be studied later ty try to determine if the bonuses help retain teachers in schools, the teachers' union said. Superintendent Susana Cordova and teacher union president Henry Roman hugged after signing the tentative deal in a conference room in the main Denver library. Democrat Gov. Jared Polis, whose administration declined to use its power to block the strike, praised the deal but said he wished it had been reached before a walkout. "Denver's kids are the biggest winners in today's agreement," he said. The teachers had demanded that the school system rely less on bonuses for educators in high-poverty and high-priority school. But the district sees those bonuses as key to boosting the academic performance of poor and minority students. The district said some of the extra money being put into teacher pay will come from cutting about 150 jobs in the district's central office and eliminating performance bonuses for staffers in the office. In Denver, there are 71,000 students in district-run schools. Another 21,000 are enrolled in charter schools that were unaffected by the strike.